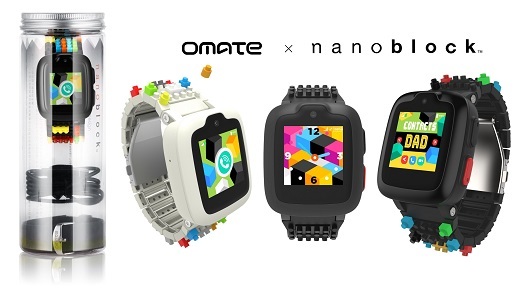 Tata Communications, a digital infrastructure provider, and wearables maker Omate are working together to equip the new Omate x Nanoblock children’s smartwatch with instant, secure, global connectivity straight out of the box. With a Tata Communications MOVE – IoT Connect™ SIM built in, the Omate x Nanoblock will pave the way towards a new frontier of digital parenting. There will be a demo of Omate x Nanoblock at Mobile World Congress in Barcelona: Tata Communications’ booth – Hall 2 H30. Tata Communications MOVE – IoT Connect™ harnesses Tata Communications’ relationships with more than 600 mobile network operators (MNO) around the world to bring the Omate x Nanoblock reliable, high-quality network connectivity anywhere in the world. These relationships also help accelerate Omate’s international expansion outside its home market in China, allowing the company to sell the smartwatch to retailers and other partners as a ‘wearable-as-a-service’, eliminating the need for separate data connectivity agreements with different local MNOs in each country. The API-enabled, automated Tata Communications MOVE – IoT Connect™ platform is fully integrated with Omate’s business processes, giving the company real-time visibility over customers’ data usage patterns, and control over tariffs and billing. This means that when a new customer switches on the smartwatch for the first time, it is instantly connected. The software-defined capabilities of Tata Communications MOVE – IoT Connect™ also make it easy for Omate to customise features and content with children’s needs in mind.